My Home is the kind of place that, once they know about it, people come back to again and again. Located in a quiet area just 15 minutes’ walk from Pub Street, My Home offers budget travellers clean, bright ensuite rooms, with breakfast included, a lush garden restaurant and a large pool with spacious sun terraces that would be the envy of many a midrange hotel — all from just $14 a night. 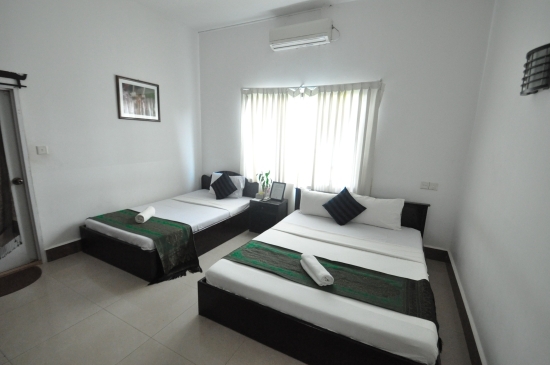 We know one regular visitor to Siem Reap who could easily afford to stay in plusher surroundings, but who loves the comfort, convenience and service they get here. While My Home’s name might conjure up images of a homely British seaside — complete with net curtains and lace dollies — the reality is refreshingly modern and the most homely thing about this friendly guesthouse is the welcome you receive from the English-speaking staff as you enter the cool wood and wicker-furnished reception area. Here you can hire bicycles, drop off your dust-covered laundry and book a range of tours to the temples of Angkor and beyond. Rooms at My Home don’t have their own safe but you can entrust your valuables to the reception staff who will store them securely in the hotel’s own safe – access is not 24 hours however, so make sure you don’t give them your passport for safe-keeping only to remember you need it as you depart for the night bus to Phnom Penh because you won’t be able to retrieve it. Looks like it belongs somewhere more expensive. A corridor runs from reception to a rear door which opens onto a slightly shabby courtyard and laundry drying area. But it’s worth persevering as beyond here is the eponymous tropical garden and the guesthouse’s undoubted piece de resistance, its large outdoor pool. The terraces are furnished with plenty of sun loungers and there are areas of sun and shade so you can enjoy this lovely spot at any time of day. Toilet facilities are also out here so you don’t have to traipse back through the guesthouse to your room to answer the call of nature. You don’t find many $14-a-night guesthouses with one of these; one of the longest pools we found in Siem Reap. My Home’s 26 ensuite rooms are fairly spartan but painted white they feel mostly spacious, though the bathrooms are small and can be under-lit. All the rooms though are clean with white bed linens, colourful runners and the odd framed print to liven them up a bit. Single rooms all have a double bed, and although some are larger than others, they are good value for a short stay. You may wish to see a selection of rooms if you are staying long term as some of the smaller rooms can feel a little claustrophobic after a few nights. Rates range from $14 a night for a fan-only single in low season to $30 a night for an air-con triple. Air-con doubles and twins are a very reasonable $25 in high season and $20 in low season. Fan-only double and twins are even better value at $17 in high season and and $14 in low season. Long term discounts range from 5% to 15% off normal rates, depending on length of stay, and possibly more if you walk in off the street when business is slack. My Home also offers various discounts for students and volunteers, and packages including free meals and temple tours. Daily drinking water, cable TV and WiFi are all included in the room rate. More comfort and space per dollar than many other places. Your included breakfast is served in the rather exotic garden restaurant out front and you can choose from a good selection of breads, eggs, cereals, fruit, pancakes and… hotdogs. Breakfast service here ends at 10:00. The restaurant also serves snacks and more substantial meals throughout the day ranging from a plate of fries at $1.75 to burgers at $3 and a choice of traditional Khmer dishes from just $2.75. Free tea, coffee and fresh fruit are available all day in reception. 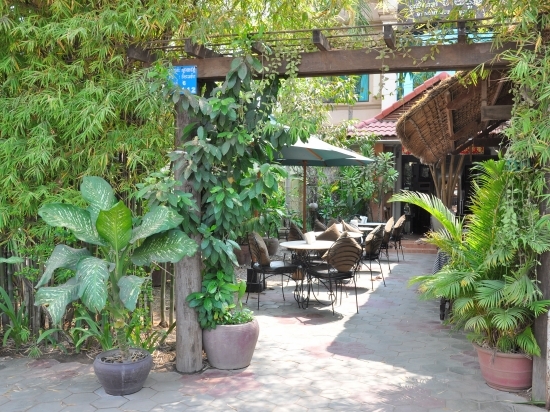 If you want more dining options the bright lights of Pub Street and the charming Old Market area are a five-minute tuk tuk ride away or about a 15-minute walk on a well-lit street. My Home attracts a discerning backpacker crowd, families, and a good share of long-term guests and expat residents lured by its great rates and excellent facilities. 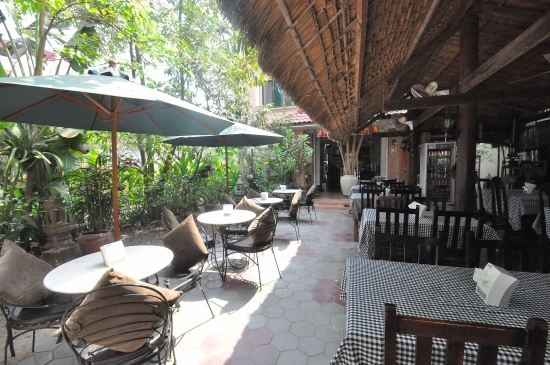 It’s an excellent choice if you’re coming to Siem Reap. Last updated on 3rd March, 2017. 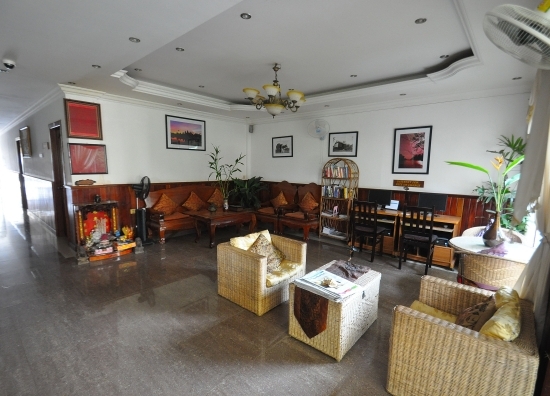 Check rates at My Home Tropical Garden Villa on Booking.com.